The Syrian Civil war has become a deadly geopolitical and humanitarian catastrophe. For the first time since Afghanistan in the 1980s, the Russian military is in combat against rebel militias trained and armed by the CIA. In Afghanistan, however, the Mujahidin defeated the Red Army, causing Mikhail Gorbachev to pull all Soviet forces from Afghanistan in 1989, leaving Soviet vassals in Kabul to their (predictably grisly) fate. In 2016, the Russian Federation’s military intervention has enabled its vassal Syrian President Bashar Al Assad to win the bloodiest civil war in the history of the Middle East since Algeria’s colonial revolt against France. Russia’s battlefield success in Syria has enabled the Kremlin to negotiate a ceasefire with the United States, consolidate its relationships with both Iran and Saudi Arabia, and deflect Western sanctions related to Ukraine/Crimea. The Obama White House has even enlisted President Putin’s help in intelligence sharing and joint air strikes against the Islamic State in Syria. Washington’s pushed demand that “Bashar Al Assad must go” is no longer on the policy agenda. In 1979, Spetsnaz commandos landed in Kabul, stormed the Presidential palace, and killed President Hafizullah Amin, a Marxist ideologue whom the KGB suspected of making overtures to the CIA and Pakistani military dictator General Zia ul-Haq. However, in one notable respect, the Soviet intervention in Afghanistan and the Russian interventions in Syria are similar. Dr. Assad, like the Marxists in Kabul, was unable to defeat rebels against his regime on the battlefield using indigenous forces alone. In fact, the Syrian regime could not have survived without military intervention by Iran’s Revolutionary Guard and Hezbollah. “The Soviets will help us” – President Hafizullah Amin, telling his adjutant as Soviet forces stormed the corridors of the Afghan Presidential Palace. The Kremlin’s “Brezhnev Doctrine” dictated that a communist state could not abandon communism, which was the reason the USSR invaded Hungary in 1956, Czechoslovakia in 1968, and Afghanistan in 1979. The Soviet Union had no loyalty to Amin, who was easily replaced by a rival Marxist Afghan apparatchik named Babrak Kamal. This is not the case in Syria. The Assad’s clan’s strategic alliance with the USSR was forged by Hafiz Al-Assad, Bashar’s father, who seized power in a military coup in Syria in November 1970. Syria was the Soviet Union’s only major Arab ally at the height of the Cold War. The Assad clan granted the Soviets a naval base in Tartus in the Eastern Mediterranean and potential leverage in Arab-Israeli diplomacy. Even now, Syria is the only ally of the Russian Federation in the Arab world and the host of its only naval base in the Eastern Mediterranean. Putin was outraged by the NATO intervention that led to the fall of the Gaddafi regime in Libya in October 2011. He wanted to ensure that the House of Assad, the Alawite rulers of Baathist Syria, were not deposed by Sunni rebels (FSA, SDF, JaF) supported by the CIA, Saudi Arabia, Turkey, and Qatar. Credit: Reuters. Syrian Bashar Assad (left) shaking hands with Russian President Vladimir Putin (right) in Moscow (2015). 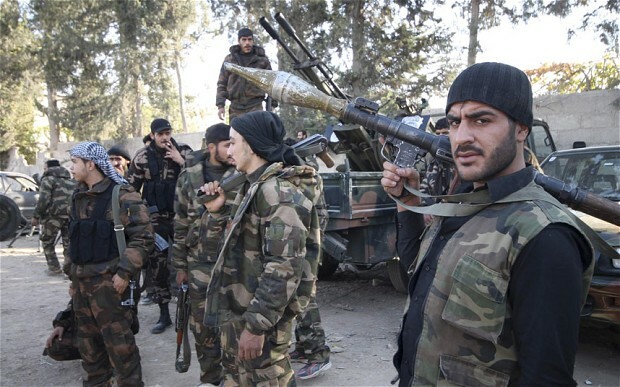 Washington is losing the proxy war in Syria. The CIA funded Free Syria Army (FSA) is now defunct, as most of its forces deserted to jihadist islamists groups such as ISIS and Al-Nusra. 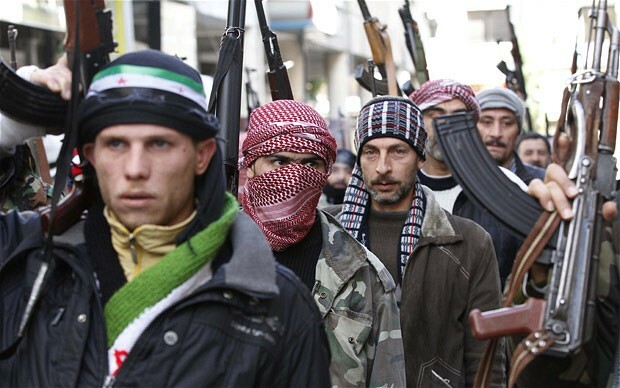 These Islamist forces were considered to be better equipped, organized and motivated to defeat Assad compared to the FSA. Most of the weapons sold to the FSA and other “moderate” rebel groups by the US have now fallen to radical Jihadist hands. Fifteen years ago, the Iraqi army was the largest military force in the Middle East. After the U.S invasion in 2003, the Iraqi state received over $1.6 billion dollars worth of financial aid for weapons, equipment and training through American military advisers to maintain order during and after the US withdrawal in 2011. Today, it is nothing but a shadow of its former self; corruption, a lack of effective leadership, and sectarian divisions within the ranks resulted in its near capitulation during ISIS’s blitzkrieg across Iraq in 2014. The Iraqi state now relies on US special forces and foreign sponsored sectarian militias (mostly Shiites funded and trained by former rival Iran) to save its own country. It is doubtful if the US and Russia can impose a sustainable political settlement in Syria. Turkey is alarmed by the de facto military alliance between the Levantine Kurdish militias and the US against the Islamic State. The Turkish war against the Marxist PKK in Eastern Anatolia make future conflicts in Syrian Kurdistan inevitable. The recent coup attempt against President Erdogan has forced Turkey to improve its damaged relationship with Russia. Today, the Kurds are the largest ethnic group in the world without a state, now forced to carve out a nation from the ongoing wars in Syria and Iraq. CIA bankrolled forces, such as the Peshmerga and Syrian Democratic Forces (SDF), are primarily Kurdish and are continuously bombed (aside from skirmishes with ISIS and Al-Nusra forces) by Turkish, Syrian and Russian fighter jets. A Turkish-Russian rapprochement could mean political disaster for the secular Syrian Kurds, who could eventually be attacked by a Baathist Alawite regime in Damascus eager to recreate Syria as a unitary state. Moreover, Turkey, Qatar, and Saudi Arabia are also jointly funding the ‘Army of Conquest’ (JaF), a joint coalition of Sunni rebel forces who are described as “powerbrokers” in Eastern Syria and of being primarily being anti-Assad and anti-Iran, but not necessarily anti-ISIS. 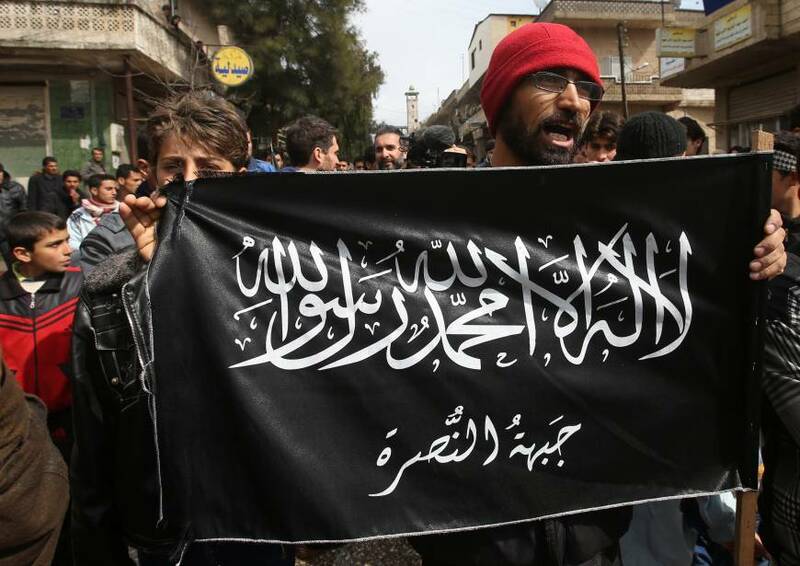 Major factions within the coalition included the Sham Legion (a Syrian Muslim Brotherhood affiliate), and a former Al-Nusra Front which has now split off from the jihadist coalition. The Turks are also funding the Turkmenistan Islamic Party, a Uyghur nationalist and pan-Islamist jihadist organisation primarily made up of Chinese Uighur’s who have left China due to years of repression from the Politburo in Beijing. Credit: American Herald Tribune. Assad forces take Kweres airbase in Northern Syria in 2015. Iran has preserved its “land bridge” to the Lebanese Shia militia Hezbollah and defeated Saudi Arabia’s Sunni proxies in Syria, as it did earlier in Iraq. Recently, Iran formally announced the formation of the Shia Liberation Army. The Revolutionary Guard led Shia militia will be deployed to arm and empower oppressed Shiite populations in Syria, Iraq and Yemen. Saudi Arabia, Bahrain, and Israel are among future target nations. Iran has also been recruiting tens of thousands of Afghan Shiites to join the war effort in the Syrian Civil War, offering them salaries to enter the conflict on the side of Bashar Al-Assad. The political and military alliance between the Alawite regime in Damascus and the Ayatollahs has made Iran a regional superpower, viewed as an existential threat by Saudi Arabia and the Gulf monarchies. Iran has “trumped” (no pun intended) Saudi proxies in Iraq, Lebanon, Syria and Yemen. President Obama predicted that Vladimir Putin’s military intervention in Syria would degenerate into a quagmire, exactly as happened to Brezhnev, Andropov, and Gorbachev’s Soviet Armies in Afghanistan in the 1980s. This has not happened. Russia has achieved its strategic objectives in Syria. The Assad regime is in no threat of immediate collapse. Russian access to its naval and air bases in the Mediterranean coast are assured. Russia has demonstrated its commitment to the survival of its vassal state, attained a seat at the Great Power negotiating table in regards to Syria, and tested its most advanced military technology on the battlefield. Leonid Brezhnev and his Soviet successors lost a proxy war with the United States in Afghanistan. Vladimir Putin has won his proxy war against the United States in Syria. The US devalued its global credibility as a superpower after President Assad ignored Obama’s “red line” and used chemical weapons and barrel bombs against civilians in 2013. The US was unable to engineer the overthrow of the Assad regime or prevent Russian military intervention against the CIA’s Sunni rebel proxies. Even the defeat of ISIS will not resurrect Syria and Iraq as unitary states: the sectarian bloodletting in the Levant. The Mujahidin – Afghan guerrilla forces sponsored by the CIA and Pakistan’s ISI to push the Soviets out of Afghanistan in 1979. Members would later go on to found Al-Qaeda and the Taliban. The Iranian Revolutionary Guard – Elite branch of the Iranian Armed Forces responsible for protecting the post-revolutionary Islamist system in Iran and “spreading the Islamic Revolution” across the Islamic World. Apparatchik – A member of a Communist Party administration.